In large bowl, beat pudding mix and milk with wire whisk about 2 minutes or until well blended. Let stand 5 minutes or until thickened. Stir in condensed milk. Fold in 1 1/2 cups of the whipped topping. Reserve 15 cookies for garnish; crush remaining cookies. Divide crushed cookies evenly among 15 lowball glasses or glass dessert dishes. Layer evenly with 3 of the sliced bananas and the pudding mixture. Just before serving, top each parfait with remaining whipped topping. Garnish with remaining sliced banana, reserved whole cookies and the chocolate shavings. This is banana pudding for the chocolate lover. 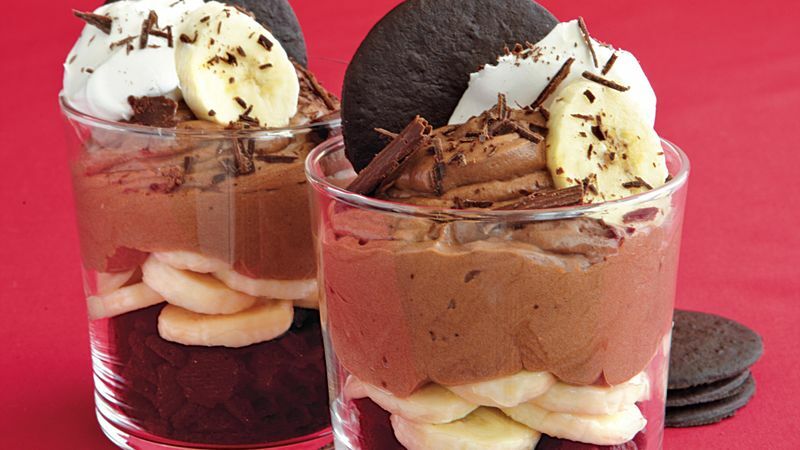 Rich, creamy chocolate pudding replaces the traditional vanilla flavor, and chocolate wafer cookies add layers of texture.